Yes, curiously enough, ESPN has made a television series based on gambling (specifically poker) in Vegas. Although a bit corny and repetitive at times, the eight-episode series will surely entertain fans of the game. This three-DVD set is packed with goodies that will definitely satisfy anyone’s hunger to know more about the show or about poker in general. Madsen: You gonna bark all day, little doggie, or are you gonna bite? Tilt is a dumb show, plain and simple. From the characters to the plots, there is just one thing after another to shake your head at. That said, it’s hard not to be drawn in by the intense poker matches with high stakes shot from insane camera angles. But the stories take themselves too seriously. Here’s an example of one of the 30-minute episodes as described on the DVD sleeve: “Clark, Miami, Eddie and the Matador all make it through to the final table. Nickle and the FBI close in on Everest. Will the Matador have the last laugh?” Ridiculous? Yes. Entertaining? Highly. 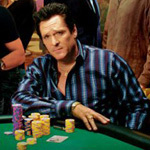 Michael Madsen stars as the “Matador,” with a “You gonna bark all day, little doggie, or are you gonna bite?” attitude. He is a poker god in the world of Texas Hold ‘Em who resides at the Colorado Casino and consistently cheats his way to victory. Three smug card players, Eddie, Miami and Clark, who have all been cheated by the Matador at one time or another, join to bring down the legend. We follow the trio around Vegas, watching them gloat about how good they are at poker and playing high-stakes, no-limit games. Even though it’s quite painful to watch these three act, it sure is fun watching them play games. The show is shot like a real sports movie, with fast camera pans, quick cuts, and melodramatic slow motion. Although the poker playing kept me at the edge of my seat, I found the tired jargon that was used to describe every hand annoying. But overall, I was impressed by how much I enjoyed watching the series. Once you get past the absurdity of the story line, it’s time to sit back and watch the eccentrically filmed card games. The third disc contains a variety of bonus features. The most thrilling of the extras is the alternate season finale, which turns out to be resoundingly better than the one they left in the series. It gives much more closure to a few of the characters’ stories, while being shocking and moving at the same time. God knows why they didn’t use it. The outtakes and auditions are just what they sound like, and unless you are into those kinds of things, I’d say skip them. For you big poker fans, the 1998 World Series of Poker Final Table is right up your alley. This 40-minute exhibition is very entertaining, but can really be enjoyed only once. People who admired the show might enjoy seeing some of the deleted scenes and the Virtual Tour of the Colorado Casino with Eddie Cibrian, although I quickly passed on them. The audio commentary and Behind the Scenes are the two features that should be avoided at all costs . The commentary is done sleepily by executive producers and creators Brian Koppelman and David Levien, whose droning literally made me doze off. I was hoping the Behind the Scenes feature would give some insight on how the poker games were developed for the episodes, but alas, the silly actors just talk about their even sillier characters. The DVD transfer is nearly flawless. The picture is crystal clear, which makes all of the fast tracking and dramatic zooms much easier to handle. The sound is usually good, but sometimes in the midst of the busy casino, the voice levels sound a bit awkward. Other than that, everything seems top notch. For an avid poker junkie, this is pure gold. You’ll love every episode, along with the extras provided. For someone looking for a good sporting show, results may vary. Otherwise, if you just wanna watch some entertaining poker matches, turn off your brain and get ready to be entertained!